While you can add email addresses to Website Builder's contact manager one by one, you also can import your entire contacts list with a bulk upload. When used in combination with the included GoDaddy Email Marketing Starter plan, you can send out sales alerts, newsletters, and other items to promote your site. If you have no contacts, click Create Contact. 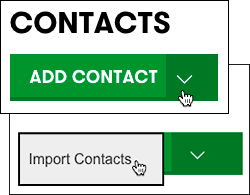 When the Contacts tab's content changes, click the arrow next to Add Contact and choose Import Contacts. Note: Not sure what a .csv file is? Learn more about the format. Navigate to where the sample file (example.csv) was downloaded. Open it and you'll see that it contains a header row and a single sample contact. For each contact you want to add, you must fill in the email address in the email column. It's entirely optional whether you also include a contact's name, company, or phone number. Note: Do not change the name of the email header; otherwise your upload will be not be accepted. Don't worry about duplicate contacts: Website Builder will filter them out even if you re-upload the file after adding more contacts. When you're done preparing your contacts file and have saved it in the .csv format , click Choose File, navigate to the file, and click Upload. When upload confirmation displays, the contacts in the file will be added to your Online Store store list. contact sign up list ?